CAPE CANAVERAL, Florida -- Preparations for the second landing of the X-37B, the U.S. Air Force's secretive unmanned, reusable space plane, are underway at Vandenberg Air Force Base in California according to military officials. While the exact landing date and time will depend on technical and weather considerations, it is expected to occur during the early- to mid-June time frame, possible Father's Day weekend. Space professionals from the 30th Space Wing will monitor the de-orbit and landing of the Air Force's X-37B Orbital Test Vehicle mission, called OTV-2. The X-37B launched March 5, 2011, from Cape Canaveral Air Force Station, Florida. Since then, Air Force officials say that Vandenberg crews have conducted extensive, periodic training in preparation for landing. "The men and women of Team Vandenberg are ready to execute safe landing operations anytime and at a moment's notice," said Col. Nina Armagno, 30th Space Wing commander. The first OTV was launched in April 2010 and orbited for approximately eight months. 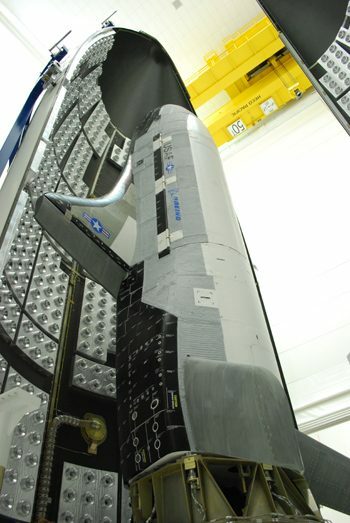 Boeing says that the X-37B design combines the best of aircraft and spacecraft design into an affordable, unmanned space-based test platform. Program objectives include space experimentation, risk reduction, and concept-of-operations development for reusable space vehicle technologies.